We have a wealth of experience in managing projects allowing us to oversee projects from the initial design stages, panel building in our dedicated workshop right through to final commissioning. 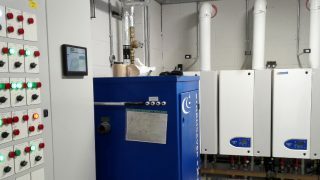 Nyke Energy employ a dedicated BMS installation team that allows us to offer a cost effective solution to installation whilst being able to oversee the entire project from start to finish. Our service engineers are able to offer maintenance solutions that include planned service visits, reactive call outs and remote support through our cost effective bureau service. Nyke Energy is an approved system intergrator of Cylon , Trend Controls and EasyIO controls. Though our extensive industry knowledge and in-depth manufacturer training we can offer a range of solutions from new build BMS control panels to reactive maintenance and servicing. We also support a number of other BMS controls including Heatmiser, Satchwell and Ambiflex. Nyke Energy Services is based in the heart of Shropshire which allows us to provide reliability and a rapid response to our clients needs. We are ideally placed for providing services in the Midlands, Wales and the North West however we often undertake work throughout the UK thanks to the positive reputation we continue to build. We offer a diverse range of services including panel design, manufacturing, installation and commissioning, maintenance, servicing and remote support. Once a contract is complete we offer a full range of support options to ensure your BMS is operating to its full potential. Health & Safety is at the core of our work, clients can be rest assured that Nyke Energy adopt a robust approach to health & safety..
How can Nyke Energy Services Ltd help you?